BEIJING, Nov. 19 -- China's national political advisors met in Beijing on Tuesday to discuss the key reform plan adopted last week. Yu Zhengsheng, chairman of the National Committee of the Chinese People's Political Consultative Conference (CPPCC), attended the meeting of the Standing Committee of the CPPCC National Committee. Political advisors put forward proposals concerning various reform measures mentioned in the decision on major issues concerning comprehensively deepening reforms, passed at the Third Plenary Session of the 18th Central Committee of the Communist Party of China (CPC) on Nov. 12. 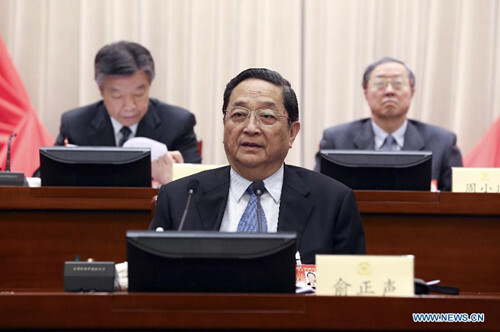 Qian Guanlin, a member of the Standing Committee of the CPPCC National Committee, suggested that the government should improve its assessment of local governments and officials. The assessment system should highlight the quality of economic growth, environment protection and public service, Qian said. Governments of different areas should be assessed by different standards, he suggested. "For example, in ecologically fragile areas and natural reserves, local governments should not be assessed mainly by economic growth but environmental indices. In an agricultural area, local governments should be assessed by the protection of farmland and agricultural output," he said. The key document passed by the CPC session has promised to stop assessing the performance of governments simply by economic growth rate. In the document, the CPC has also freed governments of some ecologically fragile and poverty-stricken areas from assessment of their economic performance. Proposals from the political advisors also covered issues of fiscal reform, private investment in small banks, independent judicial system, education and development of non-governmental organizations.